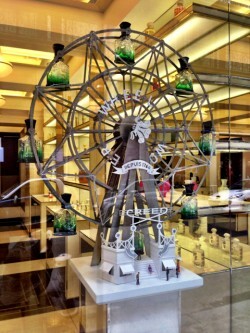 There’s really no way – in a city in which interesting new perfumeries and ‘flagship’ stores are springing up all the time – to cover both Paris’s Right Bank and Left Bank in a day. 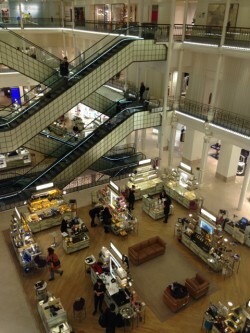 But a perfume hunt on the ‘Rive Gauche’ is going to be a more leisurely mission, simply because there are fewer stores. Here’s what we’ve found interesting, lately… Though please be aware that Paris simply shuts its doors on a Sunday; if you’re planning a weekend visit, go Friday, stay Saturday, leave Sunday – or, like us, you could easily find yourself frustratedly twiddling your thumbs on what the French still observe as the ‘day of rest’. Department store perfume shopping doesn’t get much sexier than this, since LVMH supremo Bernard Arnault gave Paris’s oldest department store (it opened in 1838) the most glamorous of makeovers: three floors of designer gorgeousness – and on the ground floor, a stunning perfumery showcasing many different (and not necessarily mainstream) brands. Miller Harris and Penhaligon’s wave the flag for Britain, while in the central area there are counters for Annick Goutal, Jo Malone London, Tom Ford, By Kilian, Piguet, Byredo, Acqua di Parma, flanked by mini-boutiques for Dior (with their Privée collection of exclusive scents), Chanel, Guerlain, Estée Lauder, Lancôme and more. The beautiful setting actually makes for relaxed shopping, not least because of the inviting sofas square in the centre of the perfume hall, to rest while you sniff. (Or park a patient shopping companion.) Once you’ve dabbed and spritzed your way through this level, be sure to take one of the extraordinarily beautiful escalators (how often can you say that?) 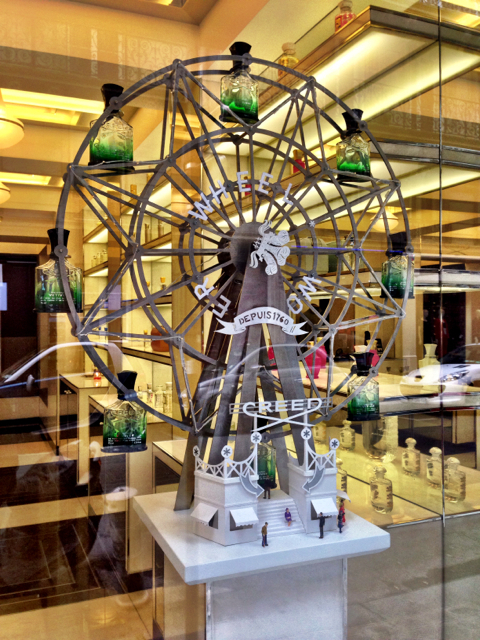 up to the higher floors: on the first floor, there’s a Diptyque boutique, and on the top, a really excellent home fragrance section with Rigaud, Welton, Quintessence and – new-to-us – Baobab Collection. (We love the Murano glass vases for their Pearls collection; pricy, yes, but they can be used for flowers when your candle’s flickered its last. If you’re visiting Le Bon Marché, there are two don’t-miss pitstops nearby: La Grande Épicerie – literally a temple to food – just behind the department store, and next door on the Rue du Bac, a proud Paris outpost of the Conran empire. Under Jasper Conran’s leadership, Conran is as seriously interesting a place to shop as it was in his father Terence’s heyday – and since Jasper’s always been a big lover of fragrance, the store is stocking an increasingly interesting selection of perfumes and home fragrance. When we visited, brands being showcased included some of the Acqua di Parma collection and Tom Daxon (from a rising British perfumer), alongside Côte Bastide and True Grace candles. Conran’s ever-changing stock means that might not be the case by the time you read this, but rest assured: whatever there is to smell at the store will be worth sniffing out. Patricia – who now presides over France’s Osmothèque museum – is a Guerlain by birth (so perfume is in her blood). But she opted to make her own independent name as a perfumer, and for 25 years has been creating wonderful scents: the delicious chypre Odalisque, ultra-feminine Rose Pivoine, Patchouli Intense (to bring out your inner hippy) and – most recently (at time of writing) a wonderfully uplifting, mossy L’Eau Mixte (shareable, as the name suggests). 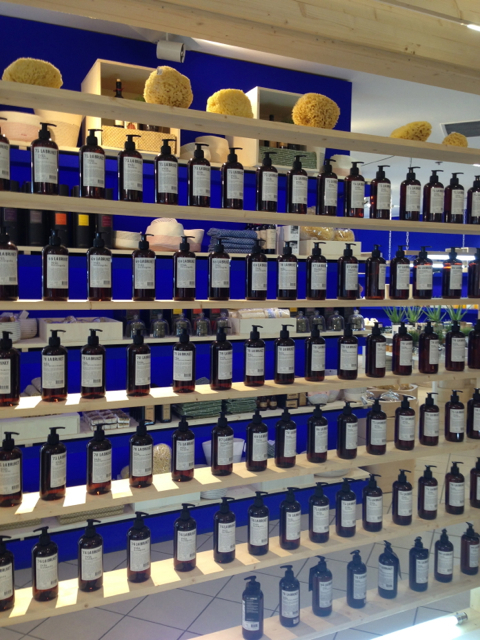 There are more than half a dozen Patricia de Nicolaï stores around Paris, but this is a little gem, showcasing her collection of perfumes and – equally deliciously – home fragrances (everything from linen sprays to reed sticks and and bath products; our special favourite is the sandalwood, lavender, spice and patchouli Maharadjah, a bestseller). Just remember that in that oh-so-French way, the store closes for an hour between 2 p.m. – 3 p.m. 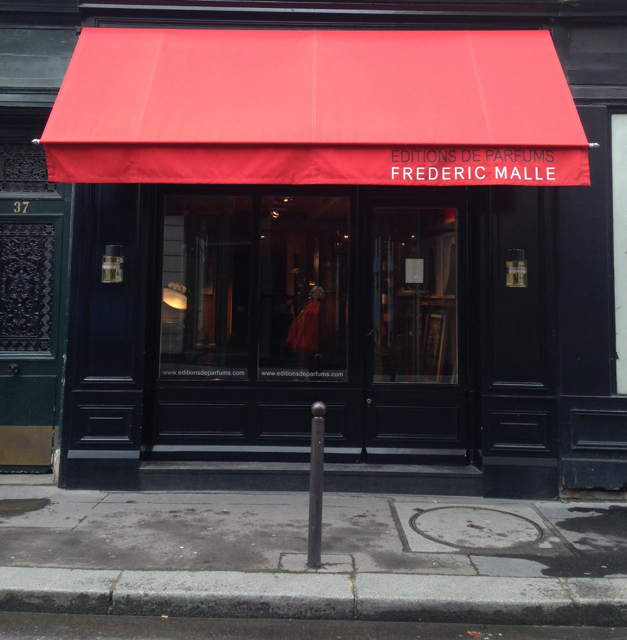 Mysteriously, Welton London’s first boutique is in… Paris. It comes as no surprise to discover that the man behind his sleek, parquet-floored boutique is an interior designer, John-Paul Welton. In addition to his own eaux de toilettes, which are created in Grasse under his creative direction, Welton London has embarked on some interesting interiors collaborations – four scents with with fellow interior decorator Kelly Hoppen (her giant candle has more wicks than any we’ve seen), Karl Lagerfeld (his silhouette’s on the candle), Christian Lacroix (the porcelain containers for his candles have a sort of lace/flock look), and stunning metallic-finish candles co-created with fashion house Courrèges: glorious Rose Intense, fresh-chypre Silver Nature (almost icy and outdoorsy), and Or Lumière, with white musk and sandalwood. Designer objets don’t come much more exclusive than the stunning 60s-style glass cube into which the Courrèges candles can be placed (and replaced). 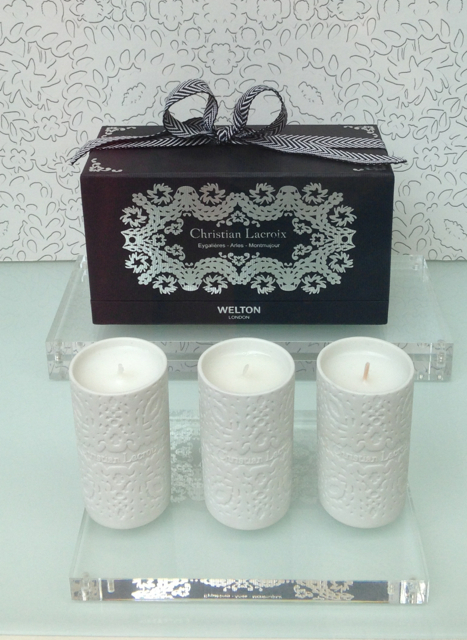 The candles and home fragrances come in black glass or striking metal, and range from Secret Amber to Imperial White Musk and Intense Wood. We’ll admit: it’s a slightly scary place to step inside (not least because of the click of heels on that parquet floor), but you won’t be disappointed. This was the original store opened by the man who changed the course of perfumery by putting the names of his perfumers on the front of the (uniform, black-labelled) bottles, after allowing those noses free rein to create the fragrances they’d always wanted to make, but hadn’t had the freedom. 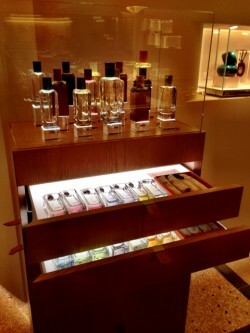 All Frederic Malle’s shops feature cylindrical glass booths in which you place your head to breathe in different scents, and with over 20 now in the collection you can while away quite a long, happy time here. Sales assistants are highly-trained (word is that several were trained at IPSICA, Paris’s perfume school), well-informed and welcoming. You may find yourself the only person in the store, on a weekday, but don’t be shy and take your time exploring the scents in this ‘intellectual’ setting (it’s decorated with coffee table art books, vintage desk, mid-Century modern chairs). The full Frederic Malle Editions de Parfums range is showcased here: not just the fragrances but candles, pump-action room sprays, body lotions – and the sublime body butters, which probably belong on any perfumista’s ‘Dear Santa’ list. If you really love your scent, there’s a coffret featuring miniatures of every single fragrance in the range, for a slightly heart-stopping 225 euros. We’re saving up, ourselves. A bright-and-airy second boutique for this historic fragrance house, which can trace its heritage back to 1760 (and England, actually). 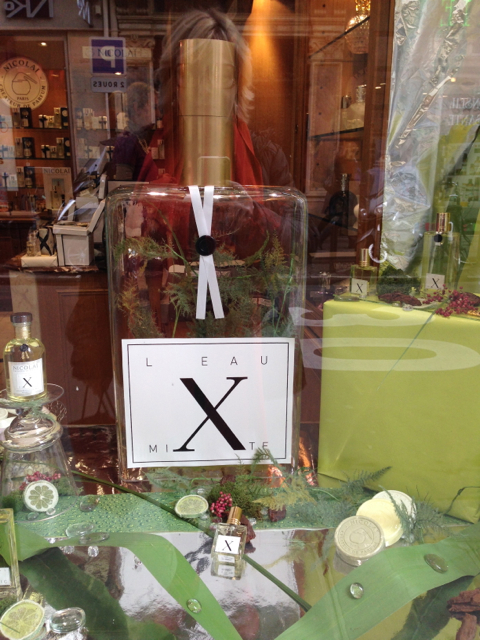 Its perfumers – Olivier and Erwin Creed – continue the family tradition of haute parfumerie. But alongside opulent floral Fleurissimo, romantic Love in White and the so-very-fresh Millesime Impeérial, here you’ll find – um – bespoke sheepskin slippers, cashmere socks and ties, as well as some very stylish leather travel accessories. (Some are perfume-related, such as the brightly-coloured flacons, perfect for the chic handbag – though what we’ve got our eye on is a stylish leather Creed toiletries bag…) This somehow doesn’t feel quite as luxe or quite as inviting as the flagship boutique in the 1st arrondissement, but if you’ve only got time to do the Left Bank, it’s a stone’s throw from the Rue de Grenelle, on which Frederic Malle has his shop – and a worthy detour. So different from its chi-chi Rue Saint-Honoré flagship, this ultra-modern boutique attracts a groovier crowd. The interior design deserves a detour of its own – check out the woven wood wigwams in the basement, which soar into the open central three- storey space – but you’ll also find the entire line of Hermès fragrances, including the pricier Hermessence line, created by in-house nose Jean-Claude Ellena: Rose Ikebana, with its tart touches of rhubarb, smouldering Ambre Narguilé and Osmanthe Yunnan. Do spend some time trying these; you won’t regret it. The ‘Nomad Collection’ of four travel sizes (around 112 euros) is our particular lust-object. If you can’t decide whether your head, your nose or your feet are exploding at this moment, there is a (pricy) tea room on the ground floor, showcasing some very fine teas and offering excellent people-watching. Having a bottle filled from one of these vessels is a once-in-a-lifetime ritual that feels very special indeed; at more accessible prices, meanwhile, is the rest of Caron’s (pre-bottled) range, including legends like Tabac Blond, Parfum Sacré, and delicious lily-of-the-valley Muguet de Bonheur. 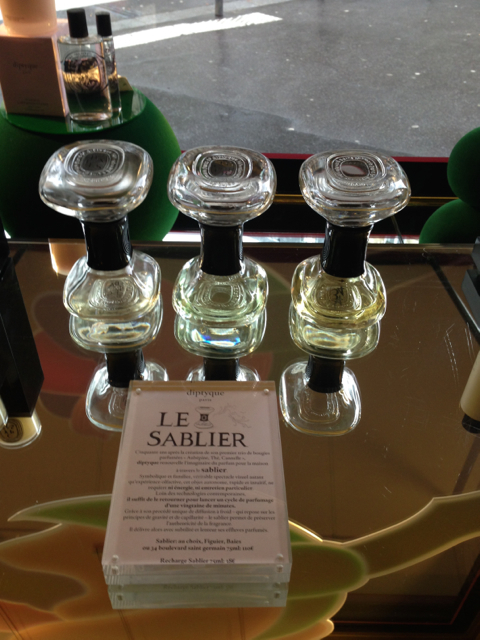 And while you’re there, check out the powders: less well-known, they’re a specialité of Caron. You’ll also find a wide selection of the indulgent accoutrements we imagine Parisian women splurge on (or their lovers do): sensuous silk scarves, gold mirrors, peignoirs and hair slides etc. Fragrance really doesn’t get more frou-frou and feminine than this. 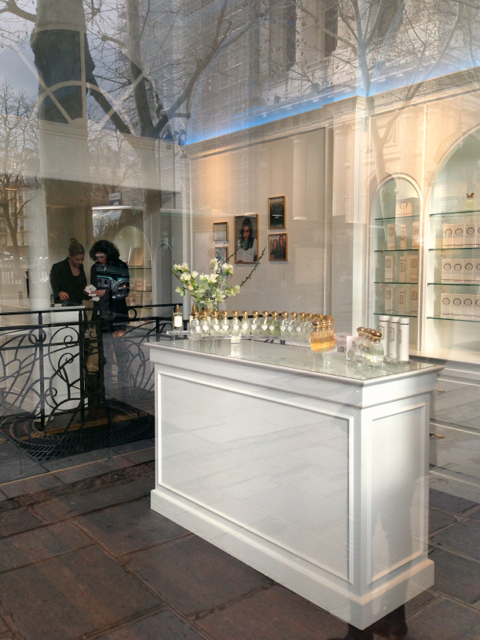 Just across the square from the imposing Saint-Sulpice church is an almost monastically simple Annick Goutal boutique. It’s had an all white-and-gold makeover recently, as has the packaging of the fragrances themselves: most now come in sleeker, squarer bottles, though the smells are as wonderful as ever. 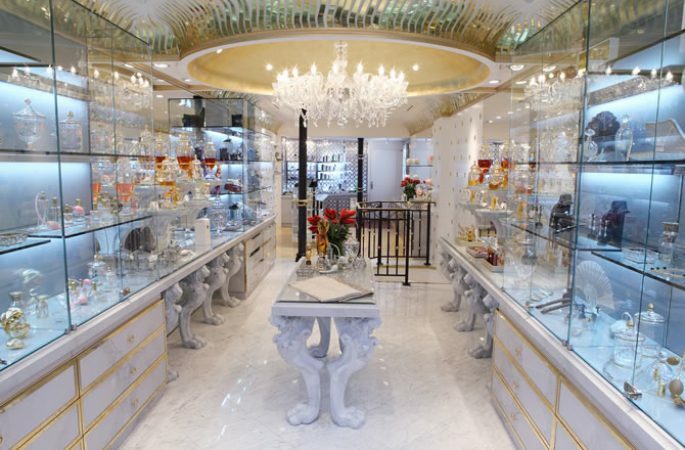 In midday sunshine, this light-filled, airy boutique positively sparkles; there are plenty of other Annick Goutal stores in the City of Lights, but this is probably our favourite. And we’ll make an observation, here: in recent years (maybe the recession biting, or simply a new generation selling perfume), fragrance sales assistants seem to have become friendlier, more approachable and more helpful, happy to let customers mooch to their heart’s content – as here – without the hard sell. Help is at hand, though, if you’re looking for a particular fragrance family or favourite note – perhaps the zesty lemon of Eau d’Hadrien, or Annick Goutal’s spin on lily-of-the-valley, in Muguet. Scented candles are also showcased (we have fingers crossed for the return of the divine violet/lipstick/leather-scented Le Sac de Ma Mère – ‘Mummy’s handbag’ – which the aforementioned friendly sales consultant hinted might see light of day again). 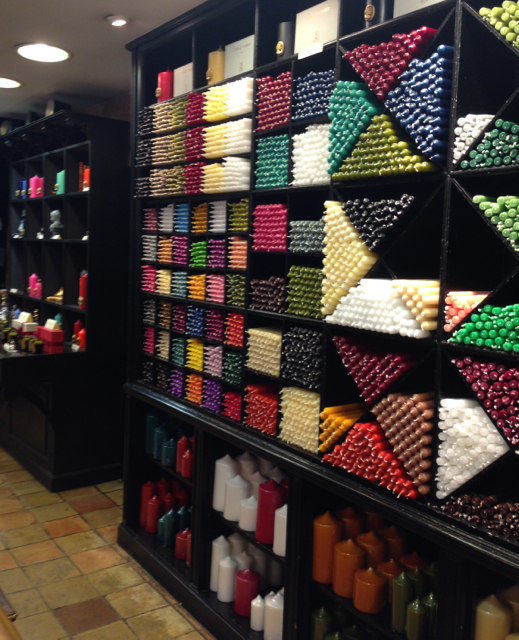 Candle-lovers, welcome to Paradise. Cire Trudon’s heritage goes right back to the 1643, when a grocer called Trudon began selling wax and candles that he produced himself. By 1719, Cire Trudon was appointed Royal Wax Manufacturer serving the Queen – and later, supplied candles to much of the Royal Court, as well as to churches and cathedrals across Europe. You’ll also find candle ‘accessories’ – snuffers, and the longest matches we’ve ever found (ideal for dinner parties or if you’ve got a serious candle habit). NB This is the Saint-Sulpice end of the Rue de Seine, not down towards the river itself. Our mistake will hopefully save some of your shoe leather. For anyone on a budget, this is a bit of a ‘find’: a fragrance collection apparently founded in 1920 (and a few hundred yards river-wards from Cire Trudon; as with quite a few streeets, Rue de Seine has slightly fiendish numbering). Lots of scented candles, drawer sachets, linen mists etc., invitingly styled – and a range of actual fragrances which caught our eye: Les Parfums de Joséphine. You can definitely leave here with something pretilly-scented without breaking the bank (which is more than can be said for most of perfumed Paris). The original boutique for the now world-famous scented candle and perfume brand (which has now branched out into skincare and sublime bodycare). Start – or finish – your Left Bank pilgrimage here, because this is way down at the other end of the Boulevard Saint-Germain from any of the other destinations we mention (a Métro ride, unless you really feel like a hike). This boutique is unmissable, though: a slightly odd-shaped shop, but with a really inviting ambience, hung with tapestries and with antique cabinetry showcasing the now-massive Diptyque range. 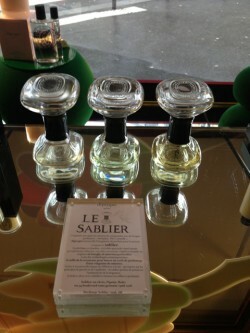 An innovation which caught our eye is Le Sablier: a double-ended glass vessel with a sponge concealed in the neck; you flip the bottle over to disperse the scent into the room; it’s currently available only in bestselling fragrances like Figuier, Baies and 34 Boulevard Saint-Germain (which of course takes its inspiration from the location of this very store) but we’ve a hunch the selection will expand. (Around 110 euros, but refills are available for 38 euros (at time of writing, anyway). Mostly we head to this boutique to dally and dither over the gorgeous smells, like the bonfire-ish Feu de Bois candle or fig-fuelled Philosykos eau de toilette. 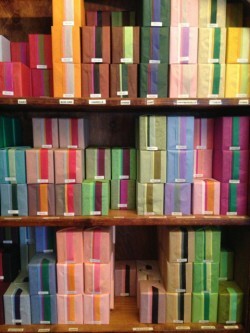 But we also find the cabinet of candles, pre-gift-wrapped with lovingly-folded coloured tissue paper (in the back of the shop) seriously pleasing – that’s them, above right.